Racism rears its ugly head, as this video shows a black man in Paris forcefully pushed off a subway train by rowdy British Chelsea fans headed for a match with Paris Saint-Germain. An investigation into their identities is underway. “We're racist, we're racist and that's the way we like it” – this is the phrase they chanted during the incident, seen here in amateur video footage taken at the Richelieu-Drouot station and obtained exclusively by the Guardian. The man tried to squeeze past them several times, before being given a hard shove. The ride was delayed by three minutes as this was happening, according to British expat Paul Nolan. “He was obviously completely shocked when they pushed him off. I don’t think he realized who they were. He then tried to get on again and got pushed off a second time,” Nolan says in reference to the black man. He says he felt “completely appalled” by the spectacle, which included several Chelsea fans suggesting stabbing someone, possibly a PSG fan. 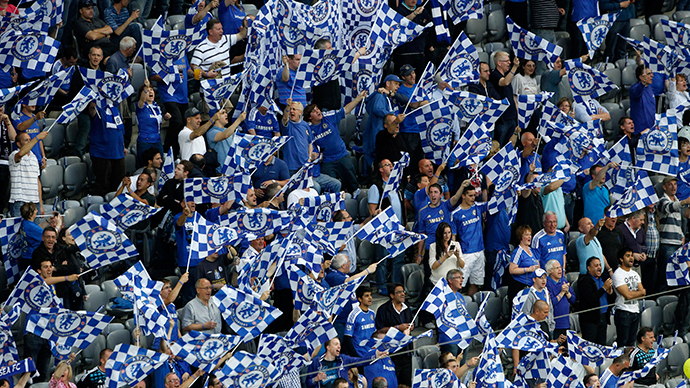 The subsequent posting of the video has led to Chelsea issuing a strong condemnation to the guilty supporters. “Such behavior is abhorrent and has no place in football or society. We will support any criminal action against those involved, and should evidence point to involvement of Chelsea season-ticket holders, or members, the club will take the strongest possible action against them, including banning orders,” the club said in a statement. Just watched video showing #Chelsea fans refusing to let another passenger on the train due to his skin colour - feel sick to the stomach. Now, Chelsea itself could face penalties if the UEFA manages to prove that the event is football-related, and therefore falls under its jurisdiction. British and French police have started their own investigations into the identities of the Chelsea fans. "The Metroplitan Police takes these offences very seriously, no matter where they occur. We will examine the footage with a view to seeing if we can apply for football banning orders, preventing people from travelling to future matches," a statement said. "We will of course assist French authorities to identify those people involved and support them in any action they choose to take. At the same tame we will be working closely with Chelsea Football Club." There was condemnation at all levels for those involved in the Paris spectacle. FIFA head Sepp Blatter took to Twitter to share his thoughts. I also condemn the actions of a small group of Chelsea fans in Paris. There is no place for racism in football! French police had to use tear gas on British supporters on the day, shortly before the game, local reports indicate.